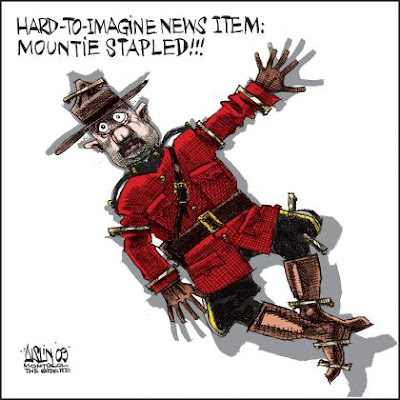 Terry Mosher (Aislin) has outdone himself with this cartoon in the Montreal Gazette. In inquiry testimony into the death of a Polish immigrant at Vancouver International Airport it became clear why RCMP officers tasered the poor fellow 4 times. Wait for it... Because he was brandishing a stapler. Yeah, pretty dangerous stuff. The man died as a result of the tasering.